I am currently watching the Showtime all day Twin Peaks: The Return marathon. We are into episode 11 on the way to the evening’s two part finale of the series. I have already had some pie, and anticipate having some more later tonight. I am very exciting about the finale, and I plan on writing up an article here with my thoughts over the whole series. However, I would be remiss if I did not mention last week’s episode, the 16th of the return. It was such a brilliant episode, giving us everything we wanted. 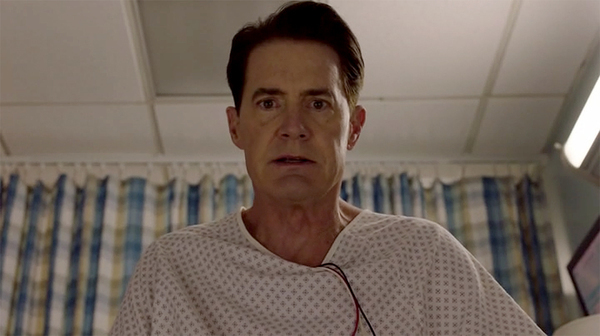 The sequence leading to the return of Dale Cooper was such a perfect piece of story telling that I can’t imagine it possibly being better. Plus, the Audrey stuff at the end, the Richard Horne resolution, the gunfight at Rancho Rosa, the Diane revelation… it was possibly the best episode of TV of the year, and certainly of the series. Tonight cannot get here soon enough. I made my way to the IMAX theater Friday night for the debut of the first two episodes of Marvel’s The Inhumans. The special showing in IMAX was meant to be a big deal. Unfortunately, much of the bad word of mouth must have done some damage as there were not very many people at my showing. I could see why. The show was extremely disappointing. The acting was wooden and dull. The dialogue was trash. The look of the show, with a few exceptions, was amateurish. It was not good television and certainly does not kick off the Inhumans on the right foot. Now, it wasn’t the worst thing I ever saw either, but with Marvel, the expectations were considerably higher. I did not enjoy Black Bolt. I thought his facial expressions did not fit the character and felt too jokey. Medusa’s hair? Ugh. Triton? Terrible. Crystal? Weak acting. What did I like? I enjoyed Karnak (possibly because he was played by Ken Leung of LOST fame) and I thought he was portrayed decently. Lockjaw was pretty good. I think this could be good if there are some serious overhauling done. Scott Buck is the showrunner and he also was in charge of Iron Fist. Iron Fist was the least loved Marvel anything … until this came along. I plan on watching Inhumans (Friday?) when it starts on ABC, but I certainly hope the quality picks up. At this point, it feels like a low quality sci-fi movie on SyFy Network. There was also the best episode of the season for the Manhunt: Unabomber. This episode was a Ted Kaczynski stand alone episode, showing his back story and how he came to be a near hermit in the wilderness sending bombs through the mail. There were remarkable scenes that really caused you to feel a connection to this serial killer that we had never had before. The brainwashing attempts by the professor at the college were heartbreaking and were nearly predatory. “Ted” brought a deeper understanding of the controversial figure, and it makes the series as a whole more interesting. Rick and Morty were back with their new episode, “Rest and Ricklaxation” last week. Rick and Morty were feeling as if they needed a break from their constant adventuring and so they headed off to a galactic spa of some sort and had their “toxins” removed, but their toxins turned out to be sentient and ready to take over their lives. Meanwhile, Morty was enjoying his new life without the toxins polluting him. It fell to Rick to try and make everything, and every one, united again. This coming Tuesday is the debut of the latest season of American Horror Story: Cult. The series sees the return of Twisty from AHS: Freak Show. It is also rumored to be a satire of the political election of 2016. Of course, Labor Day used to be synonymous with the Jerry Lewis MDA Telethon. I would watch many acts of the show and enjoy the call of “timpani” by Ed McMahon. The last few years without the telethon has just not felt right. We lost Jerry Lewis just recently, as the 91 year old comedian died. After so many years of raising money for those who needed his help, Lewis deserves to be considered a great humanitarian. So excited for Twin Peaks finale tonight. Happy viewing!